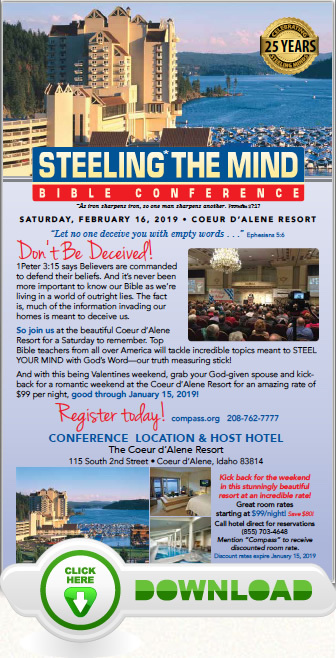 For some twenty-five years Compass’ Steeling the Mind Bible Conferences have been defending the accuracy of 2600-year-old Biblical prophecies and now we’re watching daily as they stunningly unfold before our eyes! But what does all this mean for Believers between now and the mass exodus of Believers at the Rapture? Where are we on God’s timeline? 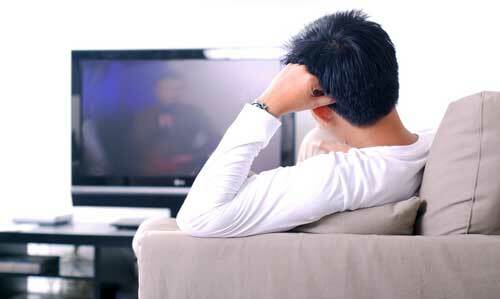 Best of all, it’s Valentine’s weekend so you can kick back for a romantic get-a-way. So grab your Bible and your babe, get excited,and come join us at the Coeur d’Alene Resort for a day jam-packed with encouragement, information, and TRUTH! Kick back for a romantic weekend at the CdA Resort! Or call The Resort (888) 965-6542. Please note: Special rates expired on Jan. 15, 2019. Great Speakers / Tough Topics! When asked to explain or defend the Genesis account of God’s 6-day Creation, there are myriads of undeniable facts you can use. But most Christians don’t know them! Russ will walk you though 10 scientific truths that make the theory of evolution look downright stupid! Surprisingly, Satan’s socialist ideology is making inroads into America—should we be worried? Yes! While capitalism has its roots in the Bible, Socialism and its close-cousin Marxism is from the pit of hell. People seem amused at Bernie Sanders, Alexandria Ocasio-Cortez, Kamala Harris, et al., but their socialistic dreams are a true threat to our Christian freedoms in America. This push for collectivism is real and this presentation will be an eye-opener—to say the least! This one’s a prophecy lover’s dream — Dave walks us through the events at the end of the 7-year Tribulation into the 1000-year reign of Christ. From the horrible Tribulation to Jesus 2nd Coming and the nations of the world being judged in the Jehosaphat Valley—a fascinating study! Speakers Luncheon Banquet and Q&A–SOLD OUT! Join us for a great CdA Resort lunch and the always-entertaining, audience-generated Q&A! Ask for clarification of a remark or try to stump the speaker! Signs of the Times: Where Have All The Pastors Gone? For the past 15 years the quality of teaching from our nation’s pulpits has dropped to new lows. If someone questions the pastor on a Biblical point they are often asked to leave. And if you currently have a good pastor, who will replace him when he retires? Uncomfortable but necessary information! This is what a Bible conference is all about—Russ will show you how to easily defend the Bible in 25 of the most-often debated and discussed topics. Bring a sharp pencil! Unfortunately, today we live in a society that includes a lot of fruitcakes. And all people, Christians included, need to know the basics about personal safety for those “what if” situations. Dave’s spent 25 years working with thousands of individuals and hundreds of corporations throughout the United States and Canada educating people on what to do if they find themselves in an active shooter situation in church, mall, movie theater, etc. You’ll remember this awesome info for the rest of your life! The Bible says Christians are actually grafted into the promises given to Israel. Paul says we’re adopted into the Jewish faith. That means when it comes to Israel, we’re family. So as much as Satan hates Christians, he hates the Jews even more. Dave will list the major lies Satan has perpetrated about the tiny Jewish nation that’s come back from the dead after 2000 years of dispersion.